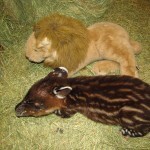 Reid Park Zoo rings in the New Year with the birth of a Baird’s tapir, born mid-day on January 4. While both the mom and male calf are healthy, the first-time mother, named Contessa, displayed poor maternal behavior. She was not nursing and displayed some aggression toward the calf. For the safety and health of the offspring, he was removed from his mother, and is being hand-raised by Zoo Keepers. by veterinary staff and Zoo Keepers. She received regular ultrasound and physical exams throughout her pregnancy. The healthy calf weighed just over 14 pounds at birth. The Baird’s tapir, native to Mexico and Central America, is often mistaken for a pig or anteater due to its unusual looking trunk-like snout. Baird’s tapirs are actually more closely related to rhinos and horses. Baird’s tapirs are endangered due to hunting, habitat destruction, and increasing human population. Contessa came to Reid Park Zoo specifically to breed with the Zoo’s male, Tupi, as part of a Species Survival Plan®, making this a significant birth for the captive population. Reid Park Zoo works in partnership with other facilities accredited by the Association of Zoos and Aquariums (AZA) to cooperatively manage threatened or endangered species, representing the Zoo’s strong commitment to the conservation of wildlife. Responsible breeding is designed to maintain a healthy, genetically diverse, and demographically stable group of animals. Reid Park Zoo is located in central Tucson within Reid Park. The Zoo is home to a diverse collection of 400 animals, many of which are rare or endangered. Admission is $9 for adults and $5 for children ages 2 to 14. The Zoo is open from 9 a.m. to 4 p.m. daily. 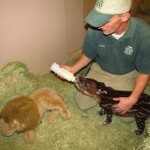 For information, call (520) 791-4022 or visit the Reid Park Zoo website at www.reidparkzoo.org.